"Manchester by the Sea goes on to be a fantastic meditation on the long tail of trauma, but one that doesn’t wallow needlessly: There’s such humor and humanity at work that the film manages to be cathartic." I thought this was a wonderful film. And it was refreshingly realistic, in that it suggested that certain kinds of trauma cannot really be fixed, but only managed. The scene where the main character simply cannot bear to reopen a connection with his ex-wife was extraordinary. I too was blown away by this story. It was a difficult watch at times, but I say that as a testament to the sincerity of the pain on display, and not because of any unecessary brutality in the telling. The writing and performances by the leads was matched by all the supporting cast. Of all the characters in the film, I found the cavalier yet hopeful way the nephew viewed his future prospects in town particularily poignant. Even after all he has experienced so far, he still sees something there for him. I look forward to seeing it again soon. Wow. What a beautifully written, gorgeously filmed, perfectly acted (Lucas Hedges is fantastic as the teenage Patrick) and smartly edited human-scale drama. The most surprising thing for me was how much humor there was; I did not expect to laugh out loud as often as I did during a movie that was also so heartbreakingly real. Humans are funny even in sad situations, is the wonderful lesson there. 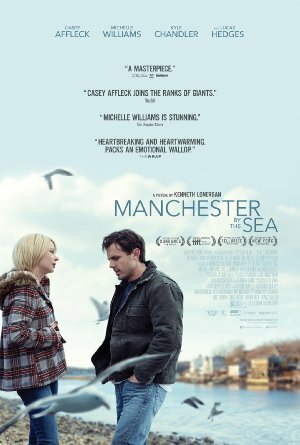 So many great scenes it's difficult to single any out, but I particularly loved the look on George's wife's face as she looks to her husband while cradling Lee in her arms, and, yeah, that scene between Casey Affleck and Michelle Williams near the end is one of the most achingly beautiful moments I've seen in a movie in years. I do have a complaint about the oppressively obvious score during the flashback to the tragedy, which was the worst, most klutzy move in the film, but the rest was brilliantly done. Great, smart movie for adults. I enjoyed the funeral scene where the music and use of slow-motion took over as the primary narrator. Also liked the scene at the end where Lee and Patrick play with the baseball, initially somewhat out of sync and with varying levels of engagement. Overall great film, funny, human characters, not overly cinematic. I understand it was meant to be understated and stoic, but Casey Affleck's performance just felt flat to me. Also, like, does his nephew not understand that his uncle killed his own children and the whole town has ostracized him because of that? Even the most oblivious of kid would have some inkling of the weight of that, or have been teased about it at school even. I liked this film, especially the way it lingered like an arthouse movie on the banal for a bit longer than necessary - inlcuding some delightfully odd editing moments, like when Lee gets into a scrap with a stranger on the street who mutters "Good parenting" sarcastically, and after the moment passes the camera cuts back to a long shot of the guy walking away, which feels simultaneously extraneous and grounding - and its careful establishment of believable emotional bonds. The last point of course being why the confrontation scene between Lee and Randi had me in an absolute flood of tears. Everything that has been carefully stacked up until that moment gets knocked down masterfully. Which is why the two things that bothered me the most about the film keep it from being as great as some of the other Mefites above rate it. One, the complete triteness of the final line, which I felt betrayed the film's simplicity and overall theme that "certain kinds of trauma cannot really be fixed, but only managed" (spot on). And two, which was much more damaging in my view: the goddamn music. In some ways the OTT use of the score, incessant, insistent, rides a line between standard Hollywood and some kind of experimental jab - seriously, it feels like the music never stops - and I'd be interested if anybody had takes on its effectiveness. For me though, it was distracting and redundant, considering the filmmaking skill on display. Consider the same film using a score by a contemporary composer, experimental noise, or even no score at all - a fantasy version that I prefer.